More from 1984’s ‘Signatures of the Soul’, this time featuring Bob Roberts and Leo Zulueta. Another “pre-glove” classic. It’s so strange to watch folks tattoo without gloves on; especially considering that most artists were autoclaving their needles and tubes by then, but not wearing gloves, covering their clip chords, etc. I always wonder if I should add postscripts on the videos reminding people that gloves should always be worn, that this is archived from a different time and all that. Food for thought. I’m not sure if the documentary is available anywhere for purchase, but if you can snag a copy anywhere, I highly recommend it. 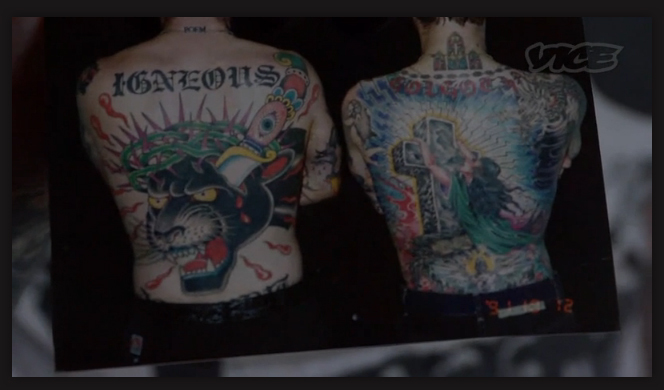 It’s a great primer for world tattoo traditions (American, Japanese, Samoan) and features great footage of some of the 80s best tattoo artists.